Product #16577 | SKU SJ3A106 | 0.0 (no ratings yet) Thanks for your rating! 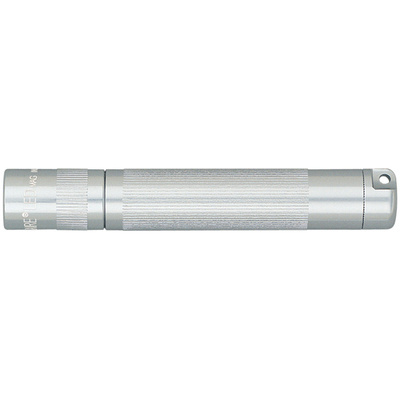 The silver Solitaire LED Flashlight from Maglite is a pocket-sized illumination tool that makes an ideal keychain light. This update to the original Solitaire light features Mag-LED Technology, which delivers extended bulb life and brighter output compared to the classic incandescent version. The Solitaire LED is equipped with a 37-lumen light source that is capable of producing a beam visible at a range of 60 yards. Like other Maglites, the Solitaire is machined from a lightweight aluminum alloy, anodized inside-and-out for enhanced corrosion-resistance, and manufactured in the United States. A weather-resistant housing and included keychain leash help make the Solitaire a reliable pocket light as well as a thoughtful gift.